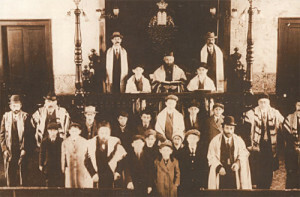 Chartered by the State of Connecticut as the Children of Israel on September 19, 1897, Congregation B’nai Israel, as it is now known, celebrated its centennial in May 1997. The exodus of Jews from Eastern Europe and Russia were escapees from the poverty of ghettos, pogroms and forced military conscription of their countries of origin. Approximately 75 Orthodox and 35 Reform families came to Danbury to participate in retail business, building trades and Danbury’s thriving hatting industry. Establishing a synagogue and a Jewish cemetery were their primary goals. Articles of Association were filed with the Danbury City Hall on October 24, 1898 for the Children of Israel Society cemetery on Miry Brook Road, a ½ acre parcel for which the families paid $100. Homes were used for services during those beginning years. A seven page constitution was dated November 24, 1904. On September 4, 1907, a warranty deed registered in City Hall conveyed property from the First Universalist Society on Liberty Street to the Children of Israel Society. A mortgage release was dated 1938. Several dozen families, third and fourth generations of the original signers of the fourteen original 1897 families still reside in the greater Danbury area. In the 1950’s, we became part of the United Synagogue of Conservative Judaism. In 1955, floods ruined our building and since more space was needed anyway, in 1967, the building was sold and eventually demolished. We purchased the Universalist Unitarian Church at 347 Main Street in 1967 and the congregation became known as Congregation B’nai Israel. This building was sold in November of 1972. Torahs were stored at the city’s United Jewish Center until two acres of land on Clapboard Ridge Road were purchased in 1974. By Yom Kippur of 1974, services were held for the first time as the roof was erected on our current building, which was dedicated in 1975 by former mayor of Danbury, Charles Ducibella. The synagogue became the lively focus for enrichment of Judaism in the area and the place to mark lifecycle events. Rabbi Stephen Parnes was our spiritual leader during the early years in our new building. In 1977 Rabbi Rick Sherwin, a recent graduate of the Jewish Theological Seminary served us with zest and youthful enthusiasm. Our religious school began and the Maimonides Day School had its beginnings in our basement from 1978-1981. In 1979, charismatic Jack Moline, a student at first, became an ordained rabbi and our first full time Rabbi until 1982. Egalitarian services, with women counted in our minyans and leading services began for us in 1986. Our USY and Kadima youth groups for teens gained national recognition and we reached out to the FCI and engaged some prisoners in our services. The local Jewish Federation in Danbury was also in the glory years of its mission. Rabbi Josef Davidson was hired in 1996 and enhanced our services and brought social action projects and community service to the forefront. He also taught us about medical ethics and other areas of his expertise. In 1991, we purchased the house next door for a home for our future rabbis and their families. In 1992, Rabbi Sam Weintraub joined us and combined traditional and contemporary ideas to make our services more relevant to our congregants. When Rabbi Vivie Mayer came in 1996, she interpreted text, added spirituality and her dynamic and innovative leadership to our CBI family. Our members continued to be involved in all Jewish organizations in greater Danbury, especially the Federation, in numbers disproportionate to the small size of our membership. Rabbi Nelly Altenburger came to CBI in 2006 and has continued to add to the learning, growth and development of individual members and our congregation as a whole. As we look forward to our 120th birthday, we look back with pride to our founders and to all those, over the years, who have been a part of our B’nai Israel community with a commitment to continue our tradition. Photos from the Centennial Journal. Click images for enlargements.